There are just not enough games that allow you to go in a one-­on­-one battle with Santa Claus. 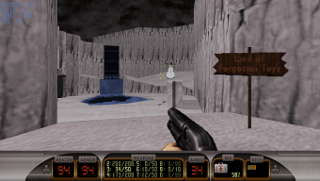 Anyway, Duke Nuclear Winter is an Xmas­ themed expansion pack for the smash ­hit shooter from 1996, Duke Nukem 3D. Developed by Simply Silly Software and released in 1997 (five days after Christmas), this add­on is a bit of a letdown compared to the other brilliant official expansion packs for the game. 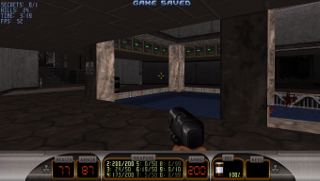 The expansion required the Duke Nukem 3D Plutonium Pak or Atomic Edition, for it used a fair bit of new content found in the official add­on. Duke Nuclear Winter has a pretty funny plot to it. A snowman in a top hat tells a tale about Xmas almost getting ruined for good. Duke receives a telegram, informing him that those alien bastards have returned! Even more so, they teamed up with a splinter faction called the Feminist Elven Militia (F.E.M – get it? ), and have managed to capture and brainwash Santa Claus! Our hero sets off to the North Pole to save the holidays. Instead of a simple slide­show for an opening and ending, the add­on surprisingly offers two animated cut­scenes, which is pretty cool, even if it is just Frosty waving his arms around and smiling. Duke Nuclear Winter offers new outfits and appearances for the enemies, such as Santa hats and red outfits for Pig Cops. New inclusions to Duke’s list of enemies are evil snowmen, which come in three varieties: one type stand still and pelt Duke with snowballs; the second replaces the Assault Commander, for it flies around on a wreath of holly and blast Freeze­thrower­ projectiles; and the third drives a sleigh with cannons alongside a grenade launcher, replacing the Pig Cop Tank. They look pretty good and are a welcome addition to the list of baddies to battle, but it’s a shame that there are no new weapons or even sprite­ swaps of the guns. Joining the fight are the F.E.M Grunts, equipped with SMGs as well as (on rare occasions) shrink rays, and the shotgun-­packing F.E.M Groans. What is unique about these enemies is that they drop presents on death. Things like guns, health or armour will pop out. The gifts certainly break the ice and do come in handy. ‘Tis the season to give, after all! At the end, the player will fight Santa Claws (not a ‘cool’ pun), who sprints around, spamming the area with gunfire and rockets. Sometimes, he will glitch out and refuse to shoot. Every time the jolly fat man is hurt, he’ll exclaim “It’s not nice to shoot Santa!”. Which is annoying. Very annoying. All in all, the final boss fight is as satisfying as getting a lump of coal for Xmas lunch. Its biggest flaw is the mediocre map quality. Out of the entire seven levels, the first two levels are basically the first two levels from the original game, which have been covered in snow and tweaked slightly. Sure, seeing how the areas have changed since Duke last visited them is a bit interesting, but going through them again still feels like a chore. The lack of any decent puzzles is disappointing, too. Even the final multiplayer­exlusive map is boring to blast through. Accompanying the levels are some cheesy Xmas songs on loop, which will either make you smile, due to the juxtaposition of happy carol songs with mayhem and explosions, or will drive you to insanity. You can give it the cold shoulder by turning the music off, of course. In the end, Duke Nuclear Winter is an average experience on the whole. If interested, Duke Nukem 3D: Megaton Edition on Steam bundles the expansion with some others, but don’t expect a brilliant time. It may be a bit fun gunning down the new selection of foes, yet the iffy map design, short length and tedious boss battle will probably disappoint more than a few. Bah, bloody humbug!